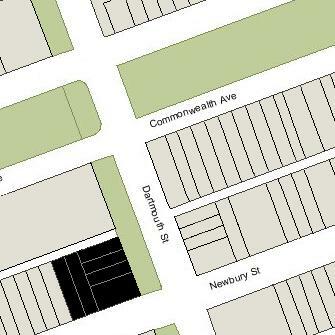 278 Dartmouth (149 Newbury) is located at the NW corner of Dartmouth and Newbury, with 160 Commonwealth to the north, across Alley 434, 150 Newbury to the south, across Newbury, 277 Dartmouth (147 Newbury) to the east, across Dartmouth, and 157 Newbury to the west. 278 Dartmouth (149 Newbury) is a public parking lot established in the late 1950s. It replaced the Hotel Aubry apartments at 149 Newbury (278 Dartmouth), two houses at 153 Newbury and 155 Newbury, and three houses at 280–282–284 Dartmouth. The property was assembled over a number of years by Aroline Chase (Pinkham) Gove, the wife of William Henry Gove, and her descendants. Click here for an index to the deeds for the properties consolidated at 278 Dartmouth (149 Newbury). Aroline Gove was the daughter of Isaac Pinkham and Lydia (Estes) Pinkham. Lydia Pinkham was founder of the patent medicine company that bore her name. William Gove, a lawyer, served as president of the Lydia E. Pinkham Company from 1900; Aroline Gove was its treasurer. They lived in Salem. William and Aroline Gove had four children: William Pinkham Gove, who married in 1907 to Olga R. Boyer; Lydia Pinkham Gove, unmarried; Mary P. Gove, who married in 1917 to Earle Carver Pitman; and Caroline Gove, who married in 1920 Lawrence Doty. Aroline Gove acquired 149 Newbury (278 Dartmouth) in July of 1908, 280 Dartmouth in February of 1909, and 282 Dartmouth in December of 1910. William Gove died in April of 1920, and in June of 1923 Aroline Gove sold 149 Newbury and 280-282 Dartmouth to Moses Shapiro, who gave her a mortgage on each of the properties and then resold them. In 1933, she foreclosed on her mortgages to Moses Shapiro and took back possession of the properties. In January of 1934, she acquired 153 Newbury. Aroline Gove died in May of 1939, and the property was held in trust under her will for the benefit of her children and their descendants. In July of 1947, the Gove trust purchased 284 Dartmouth. In about 1958, the Gove trust razed the buildings at 149-153 Newbury and 280-282-284 Dartmouth and converted the property into a parking lot. 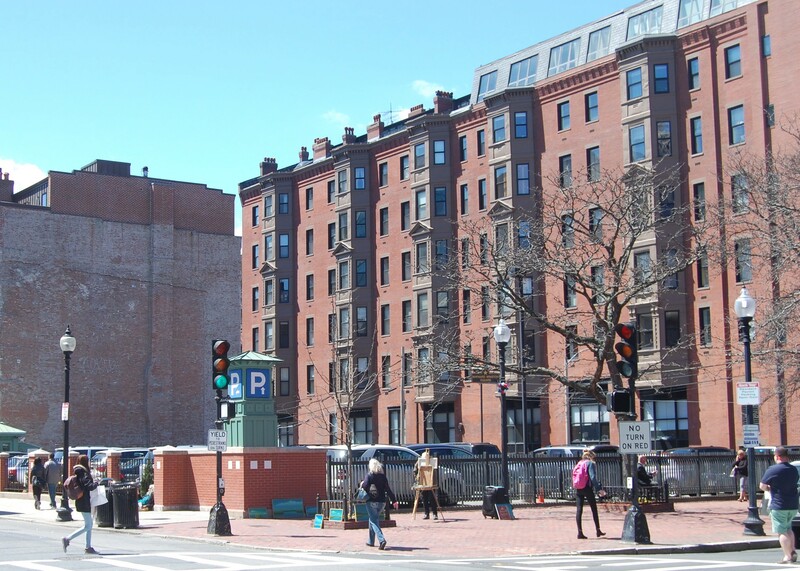 In September of 1959, it purchased 155 Newbury from the Massachusetts Audubon Society, razed the building, and added the land to the parking lot. On June 28, 1990, the Gove Trust and its beneficiaries transferred the property to The Gove Company, Inc. In 1991, the Café DuBarry at 157 Newbury commissioned noted muralist Joshua Winer to paint a massive mural on the east-facing exposed party wall, overlooking the parking lot. 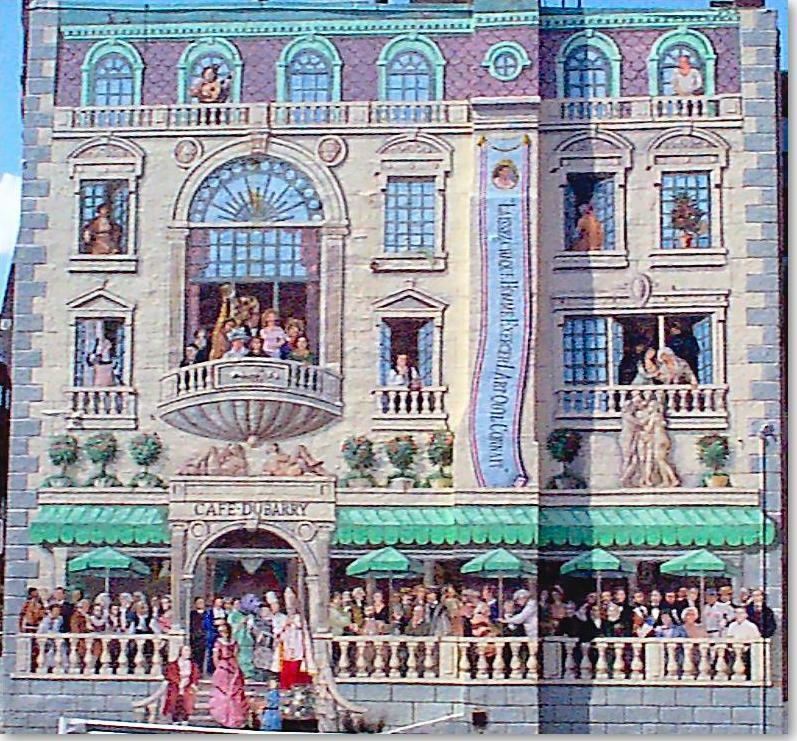 The mural, done in trompe l’oeil style, depicted a café scene with notable Bostonians from many different eras. The Café DuBarry closed in about 2001. 157-159 Newbury were sold and the mural was removed as part of the remodeling of the building. 149 Newbury (278 Dartmouth) was designed by architect William G. Preston and built ca. 1883 as a five unit apartment building, the Hotel Aubry. It was built for Levi Tower, Jr., on land he purchased on November 1, 1882, from attorney Harvey Jewell. Harvey Jewell had purchased the land from the Commonwealth of Massachusetts on March 16, 1875. Charles Austin Wood, an insurance agent and real estate investor, and the original owner of the Hotel Vendôme, previously held the right to purchase the land (it had been sold at public auction by the Commonwealth on March 7, 1871, and he either was the successful bidder or purchased the right to buy the property from the successful bidder). On April 4, 1871, he entered into a party wall and building restriction agreement with Stephen and Albert Stoddard, who held a similar right with respect to the lot to the north, where they planned to build 280-282-284 Dartmouth. Charles Wood subsequently did not acquire the land from the Commonwealth, and it was purchased by Harvey Jewell instead. Levi Tower was an apothecary and real estate dealer. 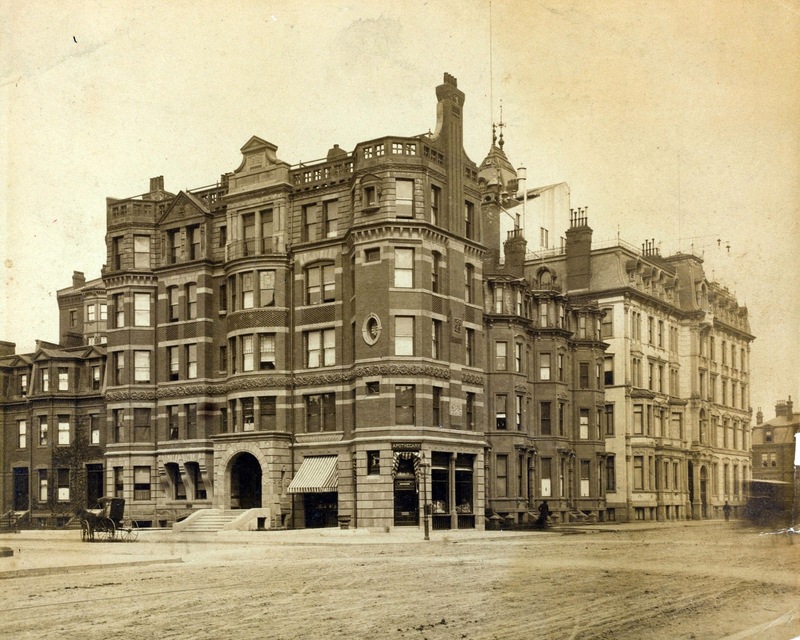 He and his wife, Mary Rebecca (Tower) Tower, lived at the Hotel Bristol (northwest corner of Clarendon and Boylston), where he also maintained his apothecary store. 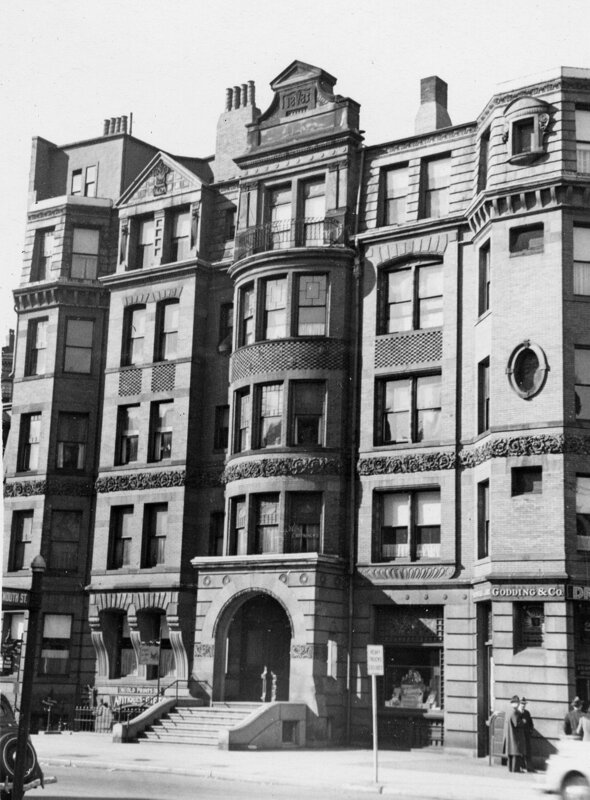 In late 1889, the Towers moved to a newly-built apartment house at 161 Newbury. He also moved his store there. 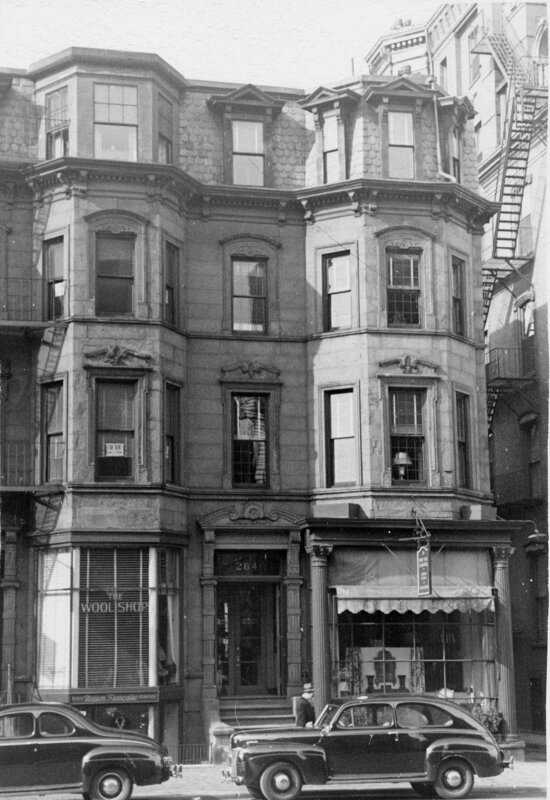 In about 1892, they moved to Brookline and he moved his store to the Hotel Aubry. On July 23, 1908, 149 Newbury was purchased from Levi Tower by Aroline Chase (Pinkham) Gove. In February of 1909 she purchased 280 Dartmouth, and in December of 1910 she purchased 282 Dartmouth. On June 15, 1923, 149 Newbury and 280-282 Dartmouth were purchased from Aroline Gove by Moses Shapiro. On April 28, 1924, 149 Newbury was acquired from Moses Shapiro by real estate dealer William J. Stober, and on December 17, 1927, he sold the property to Charles Sydney Cook, Jr. and Arthur Doane Cook, both of A. B. Stowell & Company, jewelers. They purchased 280 Dartmouth from him on the same day. On December 27, 1933, Aroline Gove foreclosed on the mortgages given by Moses Shapiro when he purchased the property in 1923 and took possession of 149 Newbury and 280 Dartmouth. Earler that year, she had re-acquired 282 Dartmouth through foreclosure. In January of 1934, she acquired 153 Newbury. 280-282-284 Dartmouth were built ca. 1871 by Stephen Stoddard and his brother, Albert Stoddard, both masons, for speculative sale. The Stoddards purchased the land for the three houses on March 6, 1872, from the Commonwealth of Massachusetts. It had been sold at the Commonwealth’s public auction on March 7, 1871, and they either were the successful bidders or purchased the right to buy the property from the successful bidder. On April 4, 1871, they entered into a party wall and building restriction agreement with Charles Austin Wood, who held the right to purchase the lot to the south, where 149 Newbury (278 Dartmouth) would be built. As part of the agreement, the Stoddards agreed “to build on their lot houses with front walls of brown stone or sand stone, three stories high and with French Roof conforming substantially to the plan and elevation of said houses now prepared by Wm. G. Preston, Architect, on the houses built by Moses Allen on Columbus Avenue between Rutland and Concord Squares…”. From this agreement, it appears that 280-282-284 Dartmouth were designed by William G. Preston, who also designed the original Hotel Vendôme across the alley to the north in 1871, and the Hotel Aubry next door to the south in 1883. On April 25, 1872, 280 Dartmouth was purchased from Stephen Stoddard and Albert Stoddard by Maria Comfort (Bates) Mansfield, the wife of Asahel S. Mansfield. 280 Dartmouth became the home of the Mansfields’ son and daughter-in-law, Ex Sumner Mansfield and Maria Edgeworth (Trowbridge) Mansfield. They had married in November of 1871 and previously had lived in Cambridge. E. Sumner Mansfield was a lawyer and later would be named Consul of Belgium for the New England states. Asahel Mansfield was a merchant and investor in real estate. E. Sumner and Maria Mansfield continued to live at 280 Dartmouth during the 1876-1877 winter season, but moved thereafter to 228 Dartmouth. 280 Dartmouth became his parents’ home. Asahel Mansfield appears to have been elsewhere in the early 1880s (possibly in the South, where he had business interests), and only his wife was listed there in the 1880 US Census and the 1880-1884 City Directories. By 1885, however, they were both living at 280 Dartmouth. Asahel Mansfield died in October of 1897. Maria (Bates) Mansfield continued to live at 280 Dartmouth during the 1898-1899 winter season, but moved thereafter Newton. 280 Dartmouth not listed in the 1900-1911 Blue Books. 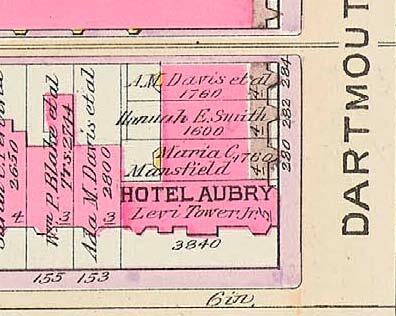 On February 20, 1899, 280 Dartmouth was acquired from Maria Mansfield by Levi Tower, Jr., who owned the Hotel Aubry next door. On July 12, 1899, 280 Dartmouth was acquired from Levi Tower, Jr., by Marie R. Liebsch. She was a milliner who lived and maintained her shop at 727 Boylston. It appears that 280 Dartmouth was converted into a multiple dwelling at about this time. On February 25, 1909, 280 Dartmouth was acquired from Marie Liebsch by Aroline C. Gove. She had purchased 149 Newbury the previous July, and in December of 1910 she purchased 282 Dartmouth. 280 and 282 Dartmouth probably were operated as multiple dwellings in conjunction with the Hotel Aubry. On April 28, 1924, 280 Dartmouth was acquired from Moses Shapiro by real estate dealer George W. Lovett, and on February 1, 1926, it was acquired from him by real estate dealer William J. Stober. On December 17, 1927, 280 Dartmouth was purchased from William Stober by Charles Sydney Cook, Jr. and Arthur Doane Cook, both of A. B. Stowell & Company, jewelers. They purchased 149 Newbury from him on the same day. By 1931, 280 Dartmouth was a mixed commercial and residential building, including the Behie sisters beauty shop, Cynthia Milliners, Maison Française gowns, and other establishments. From 1934 until 1940, and possibly later, it also was the headquarters of the Boston Girl Scouts’ Council, and in 1936 and 1937, it was the location of The Vincent Club. On December 27, 1933, Aroline Gove foreclosed on the mortgages given by Moses Shapiro when he purchased the property in 1923 and took possession of 149 Newbury and 280 Dartmouth. Earlier that year, she had re-acquired 282 Dartmouth through foreclosure. In January of 1934, she acquired 153 Newbury. On May 8 1947, 280 Dartmouth was damaged by a fire in which two firemen were injured. From the early 1950s, 280 Dartmouth was the location of an art gallery owned by Mrs. Margaret Eleanor (Moran) Brown. In the late 1940s, her gallery had been located at 240A Newbury. She died in August of 1957. On March 23, 1872, 282 Dartmouth was purchased from Stephen Stoddard and Albert Stoddard by Hannah Elizabeth (Perry) Smith, the wife of George Albert Smith. They previously had lived at 20 Ashland Place. George Smith was auditing clerk with the Boston School Committee and later was treasurer of the Educational Supply Company, dealers in chemical and physical equipment. The Smiths continued to live at 282 Dartmouth until 1906. In that year, he filed for bankruptcy and they moved elsewhere. By 1908, it was the offices of the Bay State Automobile Association. In 1908, 282 Dartmouth became the fraternity house of the MIT chapter of Phi Sigma Kappa fraternity. It previously had been located at 525 Newbury and before that at 48 Hereford. In 1909, it moved to 16 Exeter (196 Marlborough) . On December 19, 1910, the Old Colony Trust Company foreclosed on the mortgage it held given by George and Hannah Smith, and sold 282 Dartmouth to Aroline C. Gove, the owner of the Hotel Aubry at 149 Newbury (278 Dartmouth) and of 280 Dartmouth. It appears likely that, thereafter, 280 and 282 Dartmouth were operated as multiple dwellings in conjunction with the Hotel Aubry. On October 30, 1925, 282 Dartmouth was acquired from Moses Shapiro by the Howett Company. The property subsequently changed hands, remaining a mixed residential and commercial building. On June 13, 1933, Aroline Gove foreclosed on the mortgage given by Moses Shapiro when he purchased the property in 1923 and took possession of 282 Dartmouth. 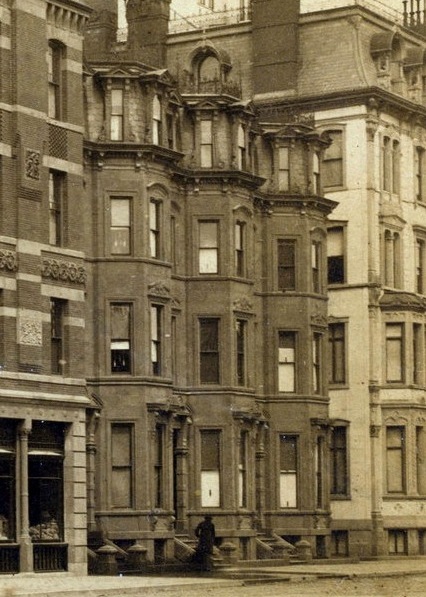 In December of 1933, she foreclosed on the mortgages for 149 Newbury and 280 Dartmouth. In January of 1934, she acquired 153 Newbury. On March 16, 1872, 284 Dartmouth was purchased from Stephen Stoddard and Albert Stoddard by retired merchant John Prince Knight. He and his wife, Marion M. (Alger) Knight, made it their home. They previously had lived at 42 Fourth Street. Living with them at the time of the 1880 US Census were his unmarried sister, Anna J. Knight, and his wife’s unmarried brother and sister, Cyrus W. Alger and Lucy Alger. John and Marian Knight continued to live at 284 Dartmouth during the 1894-1895 winter season, but moved thereafter to an apartment at 483 Beacon. On November 17, 1894, 284 Dartmouth was purchased from John Prince Knight by Ada Medora (Whitney) Davis, the wife of George Gilbert Davis, and her sister, Katherine (Kate) A. Whitney. They were the daughters of Charles Whitney, owner of the Hotel Vendôme. They leased the property to others. By the 1896-1897 winter season, 284 Dartmouth was the home of Miss Lucy Wheelock, who operated it as a kindergarten and a school for training kindergarten teachers. She also provided lodgings to students at her school and to others. She previously had lived at the Hotel Oxford (southeast corner of Exeter and Huntington). Lucy Wheelock was a pioneer in the kindergarten movement, having begun by teaching the kindergarten class at Chauncy Hall School in Copley Square in 1879 and teaching training classes for kindergarten teachers from 1888. She continued to live and maintain her school at 284 Dartmouth until about 1904, after which she moved to 134 Newbury. In 1914, Miss Wheelock’s Kindergarten Training School moved to The Riverway. It subsequently expanded its course offerings, changing its name to Wheelock School in 1930. Lucy Wheelock remained the school’s director until her retirement in 1939, after which the school incorporated as Wheelock College. 284 Dartmouth remained a multiple dwelling, either a lodging house or apartments. Kate Whitney died in October of 1909 and Ada Davis inherited her interest in the property. Ada Davis died in December of 1920. On January 27, 1926, 284 Dartmouth was acquired from Ada Davis’s estate by the Francis H. Bacon Company. The property changed hands and was acquired on April 29, 1926, by Dr. Henry Demarest Lloyd, a physician who maintained his offices at 479 Commonwealth. He and his wife, Elizabeth McEwen (Mason) Lloyd, lived in Brookline. 284 Dartmouth continued to be a multiple dwelling. On April 4, 1945, 284 Dartmouth was acquired from Henry D. Lloyd (by then a resident of Little Compton, Rhode Island) by Sun Spots, Inc.
On July 29, 1947, 284 Dartmouth was acquired from Sun Spots, Inc., by Miss Lydia Pinkham Gove, trustee under the will of her mother, Aroline (Pinkham) Gove. The trust also owned 149 Newbury (278 Dartmouth), 280-282 Dartmouth, and 153 Newbury.